George C. Edwards III is University Distinguished Professor of Political Science and Jordan Chair in Presidential Studies at Texas A&M University. He has served as both the Winant Professor of American Government and the Olin Professor of American Government at Oxford, the John Adams Fellow at the University of London, and in senior visiting positions at Sciences Po-Paris, Peking University, Hebrew University of Jerusalem, and the U.S. Military Academy at West Point. He is an Associate Member of Nuffield College and a Distinguished Fellow at the Rothermere American Institute at Oxford. He was also the founder and from 1991-2001 the director of The Center for Presidential Studies. A leading scholar of the presidency, he has authored or edited 25 books on American politics and public policy making and scores of articles and book chapters (CV). He is also editor of Presidential Studies Quarterly and general editor of the Oxford Handbook of American Politics (Oxford University Press) series. Among his recent books, On Deaf Ears: The Limits of the Bully Pulpit (Yale University Press) examines the effectiveness of presidential leadership of public opinion; Why the Electoral College Is Bad for America (Yale University Press) evaluates the consequences of the method of electing the president; Governing by Campaigning (Pearson) analyzes the politics of the Bush presidency; and The Strategic President (Princeton University Press) offers a new formulation for understanding presidential leadership. Overreach (Princeton University Press), analyzes presidential leadership during the Obama presidency. His most recent book, Predicting the Presidency (Princeton University Press) shows how understanding the nature of president leadership allows us to predict the legislative success of a president and investigates the president’s leadership of those predisposed to support his initiatives. Professor Edwards has served as president of the Presidency Research Section of the American Political Science Association, which has named its annual dissertation prize in his honor and awarded him its Career Service Award. A member of Phi Beta Kappa and a Woodrow Wilson Fellow, he has received the Decoration for Distinguished Civilian Service from the U.S. Army and the Pi Sigma Alpha Prize from the Southern Political Science Association. He is also a member of the Council on Foreign Relations. He has spoken to more than 250 universities and other groups in the U.S. and abroad, keynoted numerous national and international conferences, done several thousand interviews with the national and international press, and can be heard on National Public Radio. Grants from the National Science Foundation, the Smith-Richardson Foundation, and the Ford Foundation have funded his work. He has served on the Board of Directors of the Roper Center, the Board of Trustees of the Center for the Study of the Presidency, and many editorial boards. Dr. Edwards also applies his scholarship to practical issues of governing, including advising Brazil on its constitution and the operation of its presidency, Russia on building a democratic national party system, Mexico on elections, and Chinese scholars on democracy. He also authored studies for the 1988, 2000, and 2016 U.S. presidential transitions. 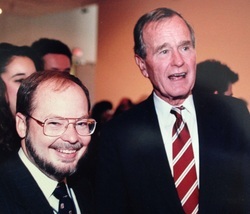 He was instrumental in bringing the George Bush Presidential Library and Museum to Texas A&M University’s campus.